Creating a poll is trivial: Enter your questions and send the vote link to your audience. That’s it! First, provide the questions: Every question consists of the question itself and one or more answers to it. Type the question into the input-field named “Enter question”. Answers are entered either after hitting the tab-key or by pointing and clicking into the desired answer field. saves your poll. Once your poll is saved, the Cockpit controls appear on the top of the screen. We ask for your e-mail to keep you informed about the ongoing development of DirectPoll. Vote: Your audience uses this link to cast votes. It can be used on nearly every mobile device. We offer a short URL and a QR-Code in order to simplify the input on the mobile devices of your voters. This voting link is static: no matter what you do with your poll (add or remove questions etc.) this link will always work. But please be aware that the poll expires 30 days after the initial creation or last save. Results: The result link will show the real-time results while your audience is voting. Open it on any display you like. All you need is a browser. Be sure to use a big display so everyone can enjoy the animation while votes are dropping in. The result page will display the QR-Code before you start the poll and whenever you stop it. Your audience can scan or enter the URL easily. Cockpit: This is your administration link. It opens the Cockpit for you. You’re free to add questions, re-arrange the order of the questions or reset votes at any time. 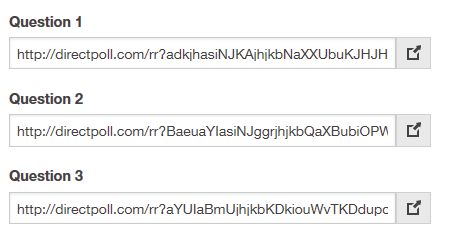 You’re receiving these links in an e-mail to your address the first time you save the poll. If you lose the Cockpit link, you will not be able to use your poll anymore. Choose between these four colour sets for your poll. Just click the one you like best and then save your poll. In addition, you can select whether you want to display the Vote-Link URL on the result page for your audience’s convenience. In order to create a poll you just need to open your Cockpit. This is the place where you add your questions; choose the look and where you steer the poll. You will prepare the questions for your audience upfront. But know that you can also create and enter them on the fly, even when your poll is running. 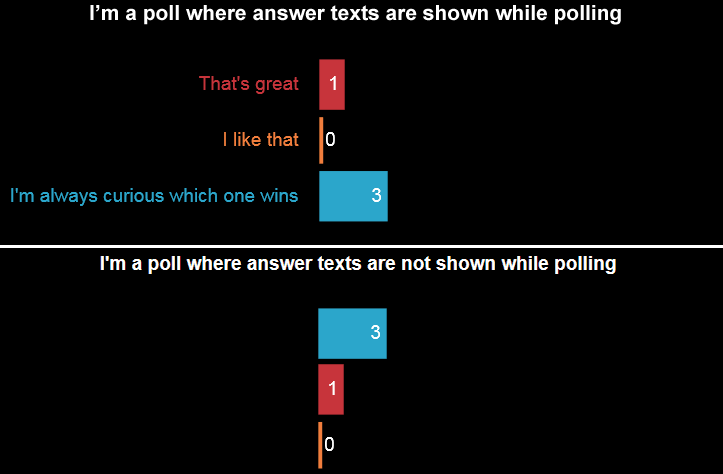 Poll questions consist of the question text and one or more answers. Entering the questions is simple: Type the question text and the answers in the input-fields. New empty questions and answer fields will appear automatically, as soon as all blanks are filled. Note that empty questions and empty answers will be ignored when the poll is saved. You can choose between single-choice and multiple-choice questions. (Additional question types are in preparation.) Just select from the dropdown menu next to the question. Just drag-and-drop the questions using the arrow handle. You can also re-arrange answers within a question. Delete questions and answers using the corresponding delete handles. Restrict access to your poll by checking “Restricted Poll” box. This step prompts you to get familiar with our usage of your e-mail and accept the Terms and Conditions. to save your preparation work again. Empty questions and answer fields will be deleted for your convenience. You’re free to alter your poll at any time. DirectPoll lets you display the correct answer after your audience has cast their votes. Here is a step-by-step documentation howto work with the feature. 1) Check “Mark the correct answer” Make sure that the checkbox “Mark the correct answer” answer is checked. You find it in the “Settings” section of each question. 2) Check “Mark as correct” Now check all correct answers with the corresponding check box that is shown on the right of each answer. All the checked answers will be highlighted after this question has been answered. 3) Poll Let your audience cast their votes. The correct answers will be shown when you click “Next” (or “Pause”) in the cockpit. Sometimes it’s bothering to see which answer gets the most votes during a poll. That might influence voters who are unsure to just tick the option that feels most correct. Therefore you might like to hide the answer text on the result page while polling. Your voters will see all answer options on their phone while casting their votes. 1) Check “Hide answers while polling” Make sure that the checkbox “Hide answers while polling” answer is checked. You find it in the “Settings” section of each question. 2) Poll Start the poll or click “Next” when you’re already casting votes. The answer with the most votes will appear on top of the result-screen when the option “Hide answers while polling” is active. All necessary information to set up your poll for your presentation are collected in the section “Links”. This is the link for your audience! Your audience accesses the poll via their smartphones. They’ll see the current question on the phone and they can directly cast their vote. We offer a short URL and a QR code for your convenience. All incoming votes are displayed here! This is where the magic happens. your poll results will are displayed live and in real-time on this page. Be sure to open this link on a large display. Set your browser to full-screen-mode for the best visual experience. Please refer to the embedding explanation if you prefer static links for results of specific questions or if you like to embed your poll into your presentation. This is the link to your cockpit. Be sure to keep it safe! You have full control over your poll here. You may add or alter questions whenever you like. Reset votes, when appropriate. You also control your poll directly from this page. Please refer to the section Cockpit Controls for detailed information. Change your e-mail address if necessary or just make sure to have all necessary links delivered to your inbox. You’ll receive a nicely formatted mail with all three links (vote, result and Cockpit link). Last but not least you may want to adapt the visual appearance of your poll results. Just click on the desired look and feel. The frame on the preview will change to a thick red line to notify you that this look is active. Additionally, you can select whether the Vote-Link URL is shown on the result page for your audience’s convenience. Don’t forget to save your poll again to activate the chosen visual appearance. You steer a poll with the cockpit. if you haven’t done so already. your poll will be ready for voting immediately. You can display the result-page and ask your audience to scan the displayed QR-code. This will open the vote-link and your audience is able to cast their votes. The active question is clearly labelled with a thick red line. You can activate any question either with the Cockpit control, tapping it or by clicking it with your mouse. The poll is controlled with the Cockpit Control, see chapter Cockpit Controls for detailed information. in order to set all votes to 0. Existing questions may be edited and even new questions may be added while conducting a poll. Any changes will be activated as soon as the poll is saved. You’re going to steer your poll with the same interface. A control unit will be shown in the upper part of the page if you have more than one question in your poll. The control unit is named “cockpit”. The result-page switches to the first question and displays the current answers for the active question. The voting-page displays a submission form to the audience. will commence your poll with the current question. A click on “NEXT” while in pause-mode will move on with the next question. Questions are switched step-by-step with the “NEXT” control. You start your poll with “START” and you move one question forward with “NEXT”. “NEXT will be disabled, if the last question is reached. Switching to a specific question out of sequence is easy with the dropdown menu on the question-control element. The active question is displayed in the middle of the question-control element with it’s number and an outline of the question. You may jump directly to any question with the drop-down menu of the question-control. “STOP” immediately ends your poll. No votes are accepted any more and the result page switches back to it’s initial state. The cockpit-control element switches back to the initial state too. A simple cockpit on the result page enables you to control the poll directly from the result page. It appears when you touch the result page or move your mouse. You may start, step to the next question, pause or stop your poll. A poll can be controlled from within a presentation using control links. Control links offer functions like “start poll”, “stop poll” or “next question”. This works with presentation software which allows you to put a link to an external website on your slide. This link comes with a special feature. Once opened it will always activate the next question in line when you press reload in your browser. This means in fact that you can steer your whole poll from a simple browser window! You can embed specific links for every question into your presentation. They can be picked up in the section “Advanced Links”. Each question is clearly labeled by it’s number. We recommend these links if you intend to switch back and forth between slides (and therefore between questions). This will prevent you from activating an unwanted question by accident. The links in this section are helpful if you intend to perform your poll in a normal way but like to step back to former results and just display them. This is a static link to a specific question. You can display the result of a specific question independently of whether it is the current question or not. These are useful links if you like to return to former results, e.g. at the end of a presentation. Note: these links will always display the result of the respective question, even when the poll is stopped.